Havant Chamber Orchestra have not performed in Emsworth for many years and we are delighted to be able to bring our string section to a venue as splendid as the new Emsworth Baptist Church! In this concert we present a celebration of the warmth and richness of romantic writing for string ensemble. The programme includes three beautiful but rather less well-known pieces. Andante Festivo by Sibelius is a superb work with all the grandeur of his larger orchestral works. The great operatic composer Puccini wrote ‘Crisantemi’ as an elegy on the death of the Duke of Savoy but re-used some of the melodies from it in his opera Manon Lescaut. Written at around the same time as the Sibelius, but harking back to a much earlier time, the Capriol Suite by Peter Warlock is an unusual work, composed using the idea of a suite of renaissance dances. These three short pieces are balanced by the giant String Serenade by Tchaikovsky. 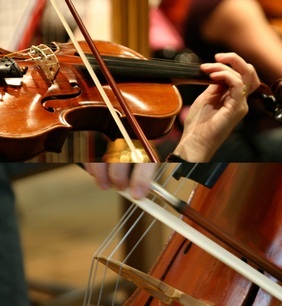 This is one of the most famous works in the string orchestra repertoire. Tchaikovsky begins with a Mozartian slow introduction to a sonata movement and completes the circle by ending the last movement with the same music. Of course it wouldn’t be Tchaikovsky without a waltz appearing along the way! The centrepiece of the evening features our string section leaders as the solo quartet in the famous Introduction and Allegro for Strings by Elgar. This was written in 1905 for the recently formed London Symphony Orchestra and some of the melodic writing comes from a Welsh tune Elgar had come across during a walk along the Cardiganshire coast. We hope it will be well received on the rather gentler south coast of England!